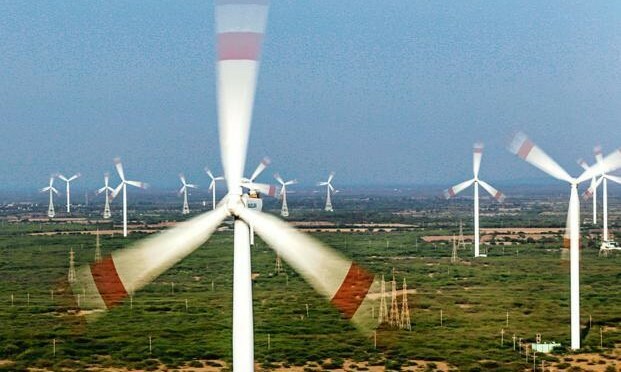 Suzlon Energy gained 2.15% to Rs 28.45 at 12:35 IST on BSE Finance Minister Arun Jaitley in Union Budget 2015-16 announced that government will target to put up projects worth 60,000 megawatts under wind power. Meanwhile, the BSE Sensex was up 296.01 points or 1.01% at 29,516.13. Finance Minister Arun Jaitley in Union Budget 2015-16 today, 28 February 2015, announced that government will target to put up projects worth 60000 megawatts under wind power. The government has increased excise duty to 12.5%. Basic rate of corporate tax will be 25% for next 4 years. Emphasising the need to generate more electricity from clean energy sources, the government on Saturday announced a massive renewable power production target of 1,75,000 mw in the next seven years. Of the total 1,75,000 mw proposed to be tapped by 2022, solar power will have a lion’s share of 1,00,000 mw followed by 60,000 mw from wind energy, 10,000 mw biomass energy and 5,000 mw of small hydro projects, Finance Minister Arun Jaitley said in his Budgetary proposals. At present, the solar power generation capacity of the country is about 3,000 mw. Small hydro power projects are plants with up to 25 mw generation capacity. The Finance Minister said the power sector had witnessed rapid growth due to efforts of the government despite uncertainty on the coal front. Besides it had launched ambitious programmes for new and renewable energy, he said. Power, Coal and New and Renewable Energy Minister Piyush Goyal had said the country’s renewable energy sector is looking to attract USD 200 billion in investments as several domestic and international firms have evinced interest in tapping the potential of green power. At present, renewable energy contributes about 6.5 per cent to the electricity mix. It is proposed that this would be taken to about 12 per cent in the next three years.